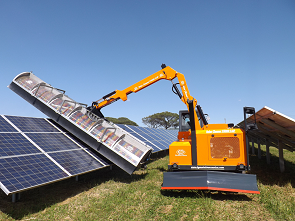 The Solar Cleaner C4000 C-AP is the most advanced version of our photovoltaic panels cleaning machines and equipment. It is particularly suitable for the big plants located in the desert, where the configuration of the soil constantly varies as a result of wind and sand.The dozer blade makes the machine able to work on any ground, leveling the soil and removing any hollow on it.It can mount brushes up to 6 meters, granting a great efficiency. The fuel tank capacity of 90 liters grants an autonomy of 20 working hours, while the water thank, with its 2580 liters capacity, grants an autonomy of 4 hours .The 24-Volt electrical system is equipped with an electronic control unit that runs the various functions of the panels cleaning machine, it’s also possible to ingreate custom programming based on the customer’s needs. During the cleaning process the automatic mode is managed via sensors placed on the brush body, wich, acting directly on the machine’s controls, guarantee a constant distance of the brush from the panels, preventing any risk of damaging them. The brush body is made of a light alloy and is interchangeable; the panels cleaning machine can be equipped with brush bodies of different lengths depending on the customer needs. They are equipped with a water collector that conveys, via solenoid valves, the water in one or other branch, depending on the rotation of the brush and the driving direction of the machine.When the machine operates with the high pressure cleaning system, the body brush is replaced by a multi-jet collector supplied on request.